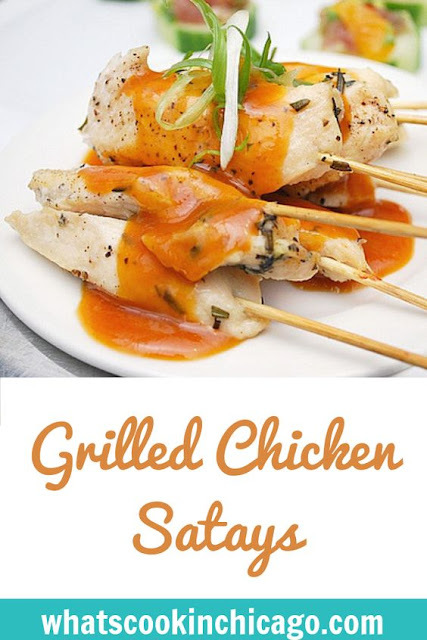 Most chicken satay recipes I've come across involve the use of curry powder. Since my client wasn't a fan of curry, I made these Garlicky Chicken Satays instead. Using a mixture of garlic and spices, chicken breast strips are seasoned and then grilled. 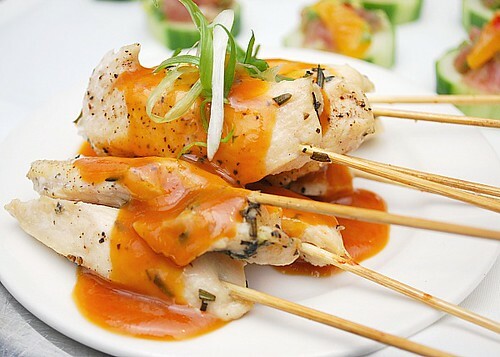 To finish off these satays, a classic peanut butter sauce is served along side. If you don't care for peanut butter (like my husband), another sauce that pairs nicely would be honey mustard or jalapeno ranch. Light a grill. In a mini food processor, combine the garlic, garlic powder, onion powder, coriander, cumin, and ground pepper. Add 2 tablespoons of the brown sugar and 1 tablespoon of the fish sauce and process to a fine paste. Transfer half of the seasoning paste to a large bowl. Add the chicken and toss to coat. Thread the chicken strips onto skewers. Drizzle with 2 tablespoons of the oil and let stand for 10 minutes. Meanwhile, heat the remaining 1 tablespoon of oil in a medium saucepan. Add the remaining seasoning paste and cook over moderate heat, stirring, until fragrant, about 1 minute. Add the coconut milk and bring to a boil, stirring. Whisk in the peanut butter and the remaining 1 tablespoon each of brown sugar and fish sauce and bring to a simmer. Transfer the sauce to a blender, add the lime juice and puree until smooth. Transfer to a bowl. Grill the chicken skewers over a hot fire until lightly charred and cooked through, about 5 minutes. Transfer the chicken to a platter or bowl and sprinkle with the cilantro. Serve with the peanut sauce. Happy New year, these look so super good!